Dog Bone BloodTrail Training Scent. $11.99. "It's good enough that I ordered more bottles to continue their training." I was amazed just how well it worked. I ran both dogs on two trails I made from one bottle at different times and they both tracked it like it was a lighted runway. The one trail was thru an area I new got a lot of deer traffic, At first they were thrown off by all the deer scent but on their own got back on the blood trail and found the bumper I put at the end. It's good enough that I ordered more bottles to continue their training. 5 stars from me. "Never used before, but definitely works." Never used before, but definitely works. Though he is only 8 weeks old he is doing really well trailing the Bloodtrail Scent I purchased from you. It works great! I used it to train my dog to find downed deer. I had a buddy shoot one and we got the dog out to see how she'd do and she went right to it. I poured it on a deer hide and dragged it. Use to train your dog to track wounded game. 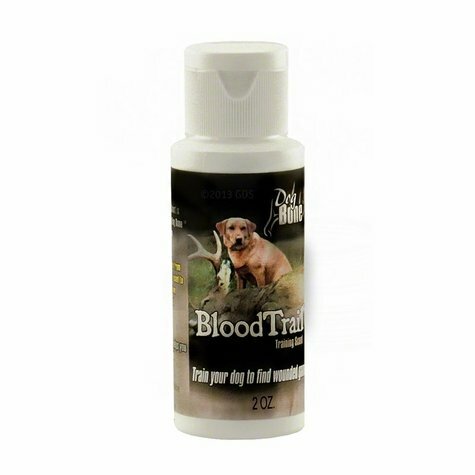 Blood Trail Training Scent is designed to simulate a big game blood trail to help you train your dog to find wounded game. Special dropper cap helps you easily simulate a realistic blood trail. Liquid scent made from actual deer blood. Made in the USA.